Things changes. Normally you can recognize a “change” from a small detail. Details reveal big differences, among which the real from the fake. The other day I was walking in a place that I was use to call a city: Venice. I was doing something, probably anything that in a real city would have been normal, but there (in Venice) impossible: I do not recall now, it doesn’t matter. However I have stumbled upon this. 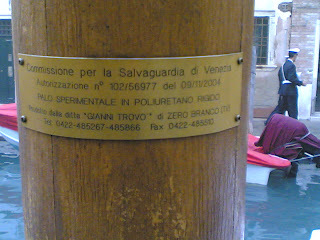 It says: “Commission for the environmental protection of Venice, art. 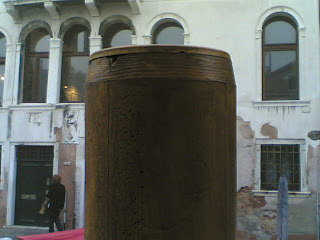 N.102/56977 experimental timber made of polyurethane”. In other words a fake timber. But it looks real from far away, as well as the city does. If Venice would be a real city, this piece of plastic would not pretend to look like it is not.